Compared to other cities in Europe or the States, København is much more awake at night than most of them. 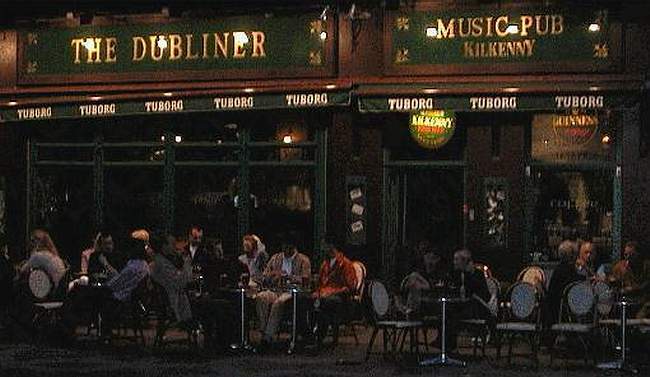 Bars close at 2:00 AM in most American cities, you get thrown out of the pub 10:30 PM in England, I remember wandering around famous & fabulous Paris 9:00 at night looking for some action but everything was closed. I'm tempted to compare København with Las Vegas (yes, there are even some posh gambling casinos here), but they're really nothing alike, thank God. Truthfully, I'm the wrong person to tell about the wonders of the night, you've got to be young and eager to exhaust the possibilities. About the time I've had my one øl (beer) after a movie-- about 10:pm say --I'm on my way home, moving against a solid flow of young people swarming into town on bikes, trains, busses, cars. Their evening is just starting! Where are all these people coming from? Don't they have to get up and go to work in the morning? They can't all be tourists on vacation. Something is happening here and I don't know what it is. Do I, Mr Jones?